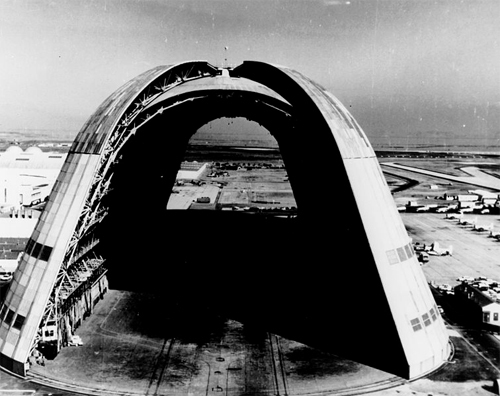 Hangar One, built in 1933 at Moffett Field in Mountain View, Calif., is currently in a state of undress. That’s because the corrugated siding covering the massive hangar, deemed toxic to the environment, is being replaced. Just to note, it’s a Navy hangar, but NASA is footing the bill to take care of it. This project has been ongoing since May, but news broke on Friday that Google is offering to pay 100 percent of the costs, that’s $33 million, associated with renovating Hangar One. So what’s the catch? Google would like to use two-thirds of the hangar’s space to store eight private jets — including a Dornier Alpha jet. Right now, there’s still a budget battle on-going and NASA is evaluating Google’s offer.